Greetings from Nepal where our second clinic is just coming to a close. The children are the complete highlight of the trip with their big smiles and happy chatter. We wanted to thank you for your support of Global Dental Relief in getting Salesforce underway. It is now well integrated into our volunteer operations and used daily by everyone. Thank you for giving us such a great start! 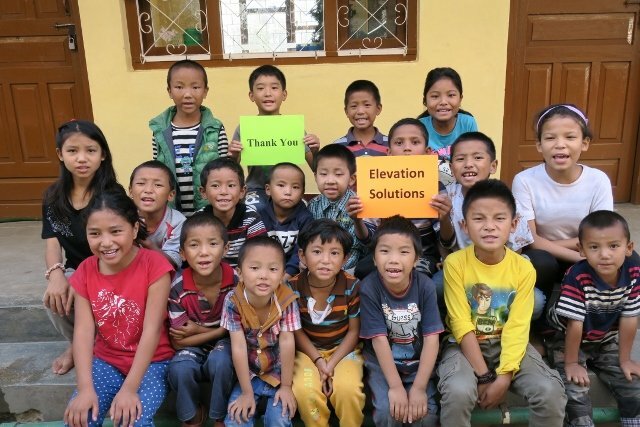 As part of your support, Global Dental Relief gratefully acknowledges Elevation Solutions 2017 sponsorship, providing an entire school with dental care in Nepal. In October 2017, 479 children from the Shree Mangal Dvip Boarding school were sponsored by Elevation Solutions for dental care. The students attended the clinic set up in a classroom in a local school in Kathmandu, Nepal. During the clinic each child received an exam, followed by restorations, extractions and a cleaning as needed. Children return to the clinic on subsequent days until all designated treatment is complete and they are restored to full oral health. At the clinic, each child also received oral health instruction which was repeated at three points during their clinic visit. They were given a new toothbrush and a preventive fluoride treatment. We loved these kids who could answer in chorus the questions of “How many times do you brush a day?” (morning and evening), and “How long?” (two minutes)! GDR volunteers for this clinic included six dentists, one hygienist and six non-dental volunteers, as well as six local high school students who served as chairside dental assistants and translators. The children attending the clinic generally live without any access to services such as dental care. Without treatment, children experience chronic pain and infection due to small cavities which are left untreated and eventually expand to encompass an entire tooth. A child in pain with infection is unable to sleep or eat properly. They fail to thrive in school and in daily life. Your sponsorship allows children to return to dental health, giving them better chance to overcome their often challenging daily circumstances. During the October 2017 clinic, 60 percent of the children examined needed dental care. The average value of the care provided was $252 (US equivalent) per child. And the clinic was a warm and supportive environment for these children. The days were packed with excited, chattering children curiously watching the elaborate proceedings of masked doctors and whirring machines in the clinic. Volunteers were moved by the children’s sometimes anxious smiles, their excited recitations of new knowledge about tooth brushing, and their trust as they reach for our hands walking to the dental chair. Your support made this care possible for 479 children – -giving them the gift of happy, healthy smiles. Thank you Elevation Solutions – we are honored by your support! Here’s how you can join us in supporting smiles like these!